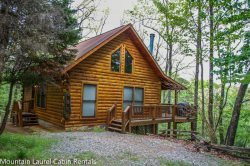 Less than 10 minutes from Blue Ridge, GA, Beautiful 3 bedroom cabin off Aska road just outside of Blue Ridge Georgia in the north Georgia mountains. Gorgeous cabin!! Loved walking to charming LilyPad Village!! The cabin was a very nice cabin with nice amenities. Wish we could have used the outdoor porch and fireplace, but the weather did not cooperate. One of the best cabins we have stayed in. Enjoyed an excellent family weekend!! Excellent cabin. Just as described. We have used Laurel cabins the last several years and will used then again. We love this place. We love the beautiful living space, porch and beautiful windows. It was also a perfect distance to Blue Ridge and the grocery store. We had a great trip. Thanks!! Beautiful cabin with a nice outdoor fireplace!! verything was great and we can not wait to come back again next year!! This was one of the nicest if not nicest cabins we have stayed in here in the Blue Ridge area. We have been vacationing here for over twelve years. Lovely cabin, beautiful view, secluded location. Who could ask for more! Very easy to book a cabin. The team member I spoke with was very helpful in helping me choose a cabin that has all the amenities I wanted. I would definitely rent this cabin property again. It is a beautiful cabin! Looks brand new! It is in a beautiful area. Quiet and hidden, but still close enough to town if you needed something. Experience was pleasant and very courteous. Great experience overall. Even enjoyed the thunderstorm and rain. We truly enjoyed our time at the cabin. You feel like home. Hot tub and pool table were great for the whole family. Beds were comfortable and having a bathroom for all bedrooms was a plus. The whole cabin is beautiful, comfortable and lots of room to spread out. TVs on all bedrooms and the master bathroom is a nice touch, although we didn't use them.